1.1) - Make sure Apache mod_defalt enabled on your server. WHM Home » Service Configuration » Apache Configuration » Global Configuration. In most cases, I'd recommend the use of Keepalives, but on busier servers I usually have this set at 3 seconds instead of the default 15. 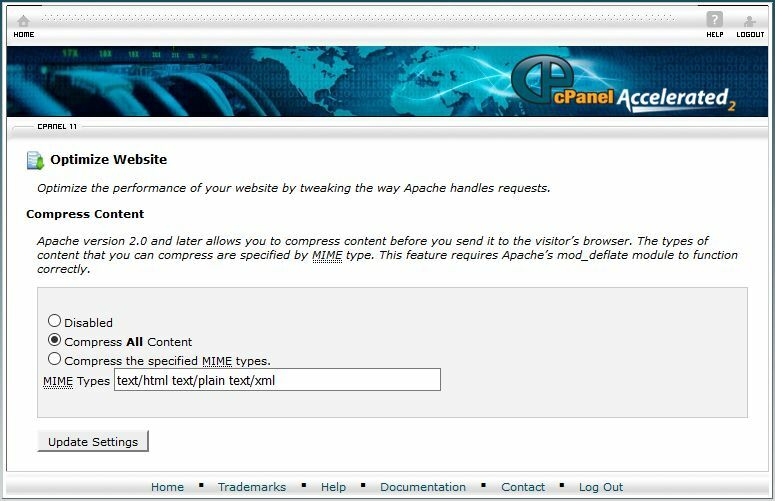 From Cpanel for the site, go into "Optimize Website" and you can enable page compression from there. To see if gzip compression is working use our gzip compression tool (https://varvy.com/tools/gzip/). Also consider using the page speed tool (https://varvy.com/pagespeed/) which will test compression and many other factors. This minor update fixes issues with SSL enabled for entire website. download the latest zip file from our website clients area using your license number. This minor update fixes the Timezone setting in account preferences and also fixes setting region in account edit profile. and build the files combined and minified. This will reduce the number or calls to the server and speed up the whole website. You can add any files and libs as you like in any template/view file or widget file. Remember after you do any changes to these JS and CSS files you need to build from the Design module to apply the changes. Build CSS Files From buildcss blocks in Views and Widgets. These links will build the JS and CSS files for you any time you want. category and does not require the user to browse to a last child category. The software comes with only one theme for everything, for the Stores themes also comes with only one theme. But you can add unlimited stores themes very easy. in the same View directory for every theme you have, for example Default/view folder. Then customize these templates to any look you want. Put that image in the theme/Default/images folder for every theme you have. Your users will see this new theme and can selet it in their store settings. This minor update adds support for UTF-8 user login (username and password). Icons=1 in the code above. You can use this css file to overwrite any css code for your RTL themes. which exists under theme/default/views folder. you can pass to the widget the location and a default location, the temperature unit, and the cash time. The location is used if the user is logged in, the default location is used if the user is not logged in or no address set in the location. Both the location and the default variables can be either the full location address cit, state, country, etc, or zip code. The plugins above will be filled with the current user information if logged in and will be empty if no user is currently logged in. This allows the widget to display the current logged in user are weahter information or a default location weather for none logged in users. cash disable the cash. Set this to a resonable time (in minutes) to avoid blocking by the weather providers thinking it may be an attack to their systems. The unit sets the temperature unit either "c" for Celsius or "f" for Fahrenheit. This Webawy update adds the support for latest Facebook API support for user registration and login pages. Update these files from the latest zip file from the Clients Area using your license number or use the Live Update tool in the admin center. html code inside the Frontpage template, and finally jquery js code for initialization and settings in the Frontpage template. You set the widget_title and widget_contents to anything you want. You can edit the file dashboard.css and add your own color classes and use them to change the widgets colors. The Collapse icon in the widget header allows the users to collapse/expand the widget. The Close icon allows the users to hide specific widget. The edit/setting icon allows the users to change each specific widgets colors individually. In the above js code, you control the "search" widget by setting the options 'movable', 'removable', 'collapsible', 'editable' to either false or true. the option "colorClasses" is array of color classes if the editable enabled that will be shown for the user to select from. In the above code the settings for three widgets search, weather, and language, you can change the settings for each widget individually as you like. You can use our Auto Installer to upload installation files to your server, skip to step 10 in this case. Download webawy.zip to your local computer or server from our site using your license number from the Clients Area. Extract the file webawy.zip to a folder on your local computer. If you downloaded and extracted direct to your unix server you may need to run dos2unix on the extracted files. folder, you can install under any folder you want or even under the site root folder. Change permissions to 755 or web executables for the uploaded files *.cgi, *.pm, and .htaccess in all folders. the installer page. Set the installer options and click the install button and wait until it finish. pointing to the program configuration, click on that link to go to the configuration. this assuming your installation folder is app, change it in the url above and use your real domain name. then add that user to the database and give it full privilages. In the Webawy Configuration, click on the "Database" tab and setup your database information. In the Configuration, click on "Setup" tab then click the link "Create SQL Database Tables" to create the database tables. In the Configuration, click on "Setup" tab then click the link "Restore SQL Database From The Text Files Backup" to load the database defaults. To reset the database stats, click on Modules, then click on the Stats module, then click on the link "Update All System Statistics". If you finished the above steps successfully then congratulations you have finished the installation and configuration. integration for Android, iPhone, iPad, and Windows Phone. Banners appear at the bottom of the application. This will helps you make very good money from Google AdMob AdSense network. We can customize the applications to your business name and logo. please check the latest demos. This minor update added a menu icon on small mobiles devices for the categories menus. In the Admin center->Configuration module, under the "Site" tab, the Fron page Module option. the featured items or ads on top of listings. Webawy 22.20 upgraded released. This version added the Breadcrumb navigation plugin to the pages. This will show the category path or current level from the app home. the code files, the language files differences, and you can manuall add the plugin code above to the templates you want. this will rotate all campaigns added to the zone Top_468. 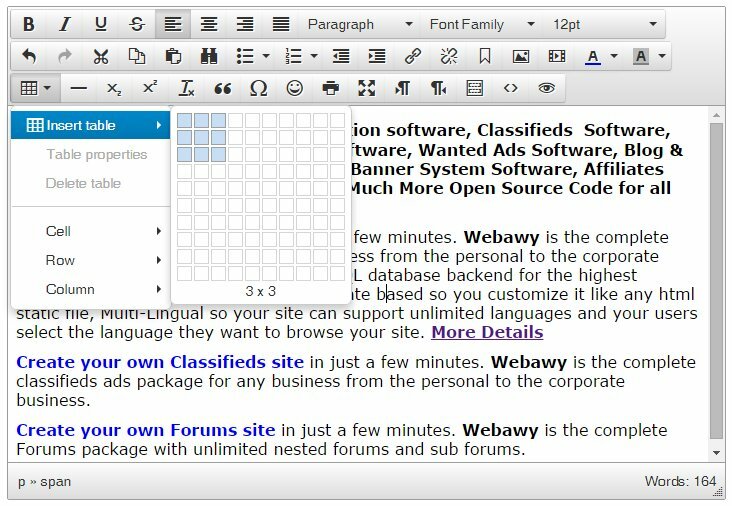 Webawy Version 22.10 Released. 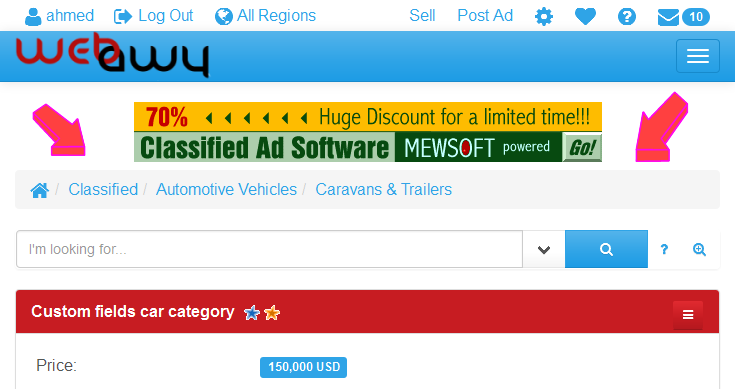 This version added category specific fields for the classifieds and the auctions. The category specific fields for example for the Cars category shows fields for the Make, Model, Color, Transmission, etc. Then you can add the custom fields to the categories in the category module. the new category specific custom fields enabled. We have released today Webawy Mobile Version (Version 22.00). will be able to select among them the theme they want to see your site. The new version ready for Mobiles, Tablets, Laptops, Desktops, and TV's. Built on the top of twitter's Bootstrap Mobile framework at http://getbootstrap.com. new theme templates and widgets and most of the language files changes. using your customer license number. Posting pages and also used in the admin "Design" module as a full standalone html editor. which already exists in the software. The default current SQL database collation was utf8_general_ci, the new upgrade uses collation utf8_unicode_ci. The new upgade also support utf8 everywhere, all software input and output now in utf8 well formed. 2)-Make sure you did installed or upgrade Version 2015 (Version 21.00) First DO NOT UPGRADE TO THIS VERSION NOW. 3)-Download the file upgrade-2015-backup.zip attached to this topic and unzip it, it contains the file upgrade-2015-backup.cgi. 5)-Change this file permissions to 755.
and wait until the file is finished, do not close the browser before the file is finished. 7)-The above steps will backup all your database files in the old format. 8)-Upgrade to the latest version 21.1.
this will restore your database in the new supported format. 10)-From your admin->Database,click the link "Database Commander".